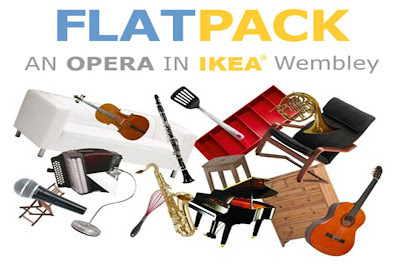 IKEA 'Flatpack the Opera' - flash opera coming to IKEA Wembley! Flatpack the Opera is an adaptation of the opera 'Abenteuer im Einrichtungshaus' (Adventures in a furniture store.) The original was written by the composer Tom Lane and received its premiere in a theatre in Berlin this March. Mammoth Music Theatre have now decided that they can take this production even further by performing the work in a working furniture store - an idea that IKEA have embraced! Flatpack the Opera is a promenade opera and each scene of the opera will take place in a different area of IKEA. Guides will lead the audience through each department to witness the action and music in every scene. Performers, audience members and shoppers will intermingle throughout the piece, blurring the boundaries between ‘reality’ and ‘performance. This creates an inclusive and entertaining experience for the audience, who become as much a part of the opera as the singers and instrumentalists. Furthermore, everything about Flatpack relates in some way to furniture, shopping and domesticity. Even the instruments in some of the scenes are reflections of this - pots and pans, cheese graters and wine glasses create harmonies with the piano, accordion and cello and in keeping with the IKEA surroundings, the opera also sets Swedish furniture names to music. I spoke to Flatpack the Opera director, Rebecca Lea and she says "The opera will take place during official trading hours and so we hope to attract the attention, not only of those who have come specifically to see the opera, but also of actual shoppers. Our intention behind the work is to attract both avid opera-goers and those with little previous experience of opera, in order to break down the often misplaced associations of opera with elitism. However, we also hope to show that the operatic medium need not always focus on the grand issues and passions of life, but can just as easily adapt itself to the simple presentation of the everyday, such as cooking, cleaning one's teeth or bookcase building." This is one of the more random events that I have seen advertised in recent years, but it sounds like it should be entertaining. On the first night there will also be a post-show talk with the cast and performers in the IKEA restaurant - all accompanied by an Opera Meal Deal! See more at www.flatpacktheopera.com or go to Facebook and search for the group called 'Flatpack : An Opera in IKEA' - YouTube video preview will be available soon. IKEA election kitchens for Gordon Brown, David Cameron and Nick Clegg!